If you have ever watched the Wales rally GB or Swedish Rally and thought I’d love to have a go at that! Now’s your chance! Extreme Rally is the UK’s premier Rally Driving Experience and with Extreme Rally you can have the Rally Driving experience, as it should be – on gravel, in the forests and on snow! On one of our exclusive and exciting Rally Driving experience days or weekend, you can get the true rally experience. Experience the unique thrill of driving a rally car on sparkling snow and ice. See the fantastic northern lights. Feel the biting cold and the contrasting warm hospitality of the northern people and explore the Sami culture. Everyone should at least once step outside his or her comfort zone so why not join us in the arctic circle for an experience of a lifetime in Swedish Lapland. Extreme Rally will help you realise your driving ambitions in the most beautiful winter wonderland of snow covered trees and frozen lakes. Let the adrenaline flow, the excitement grow and try our great winter experiences. To visit the Arctic Circle is on many people’s bucket list with Extreme Rally you can not only experience the Arctic but also have fantastic fun driving fully prepared rally cars on frozen lakes. With Extreme’s experienced instructors you are trained to handle these powerful machines fitted with studded tyres on specially prepared ice roads on the frozen lakes around Jokkmokk. So why not come to The Arctic Circle with it’s fantastic winter climate, beautiful forests lakes and mountains it’s closer that you think ! To have the opportunity to explore the fantastic winter landscape then snowmobiling is the perfect activity for you! The Ice Karting circuit is on the lake right out side the hotel and is great fun. Once you get the hang these great machines.. 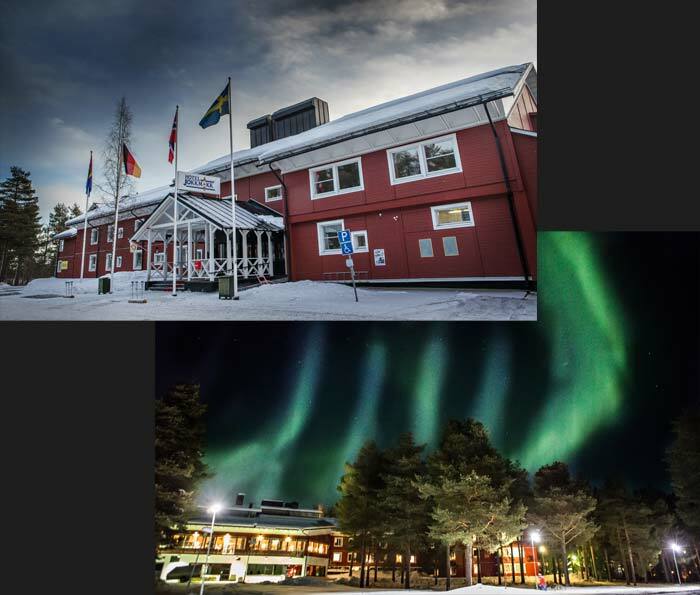 The hotel has a spacious lounge and bar with an open plan restaurant.The Hotel Jokkmokk has a collection of 88 spacious individually styled rooms & suites and is perfect for a personalized stay in the arctic circle. Guest rooms at hotel jokkmokk have cable tv and a private bathroom with shower. The restaurant and bar serves specialities from Swedish Lapland that include smoked reindeer and elk fillet. In summer, guests can enjoy their meals on the lake-view terrace. In addition, the hotel offers a pub. There is a sauna in the main building as well as a small lakeside sauna. Barbecue facilities are also available. Hotel jokkmokk is close to the city’s main street, Storgatan, and less than 10 minutes’ walk from Ájtte Museum and Sami Centre. Parking spaces are available on site. Laponia was a historical Swedish province, located in the north of Sweden. Sweden ceded the eastern part, along with the rest of Finland to the Russian Empire, creating a Swedish Lapland and Finnish Lapland. In 2010 Finland discontinued their provinces and the province of the Finnish Lapland was replaced by the Region of Lapland. In most countries, Lapland is considered to be the home of Father Christmas. In 1996 the UN Body scribed Laponia on the World Heritage List. Meaning that the world had to care and protect it. Lapoinia has unique nature and is home to some of the early signs of life on Earth. The landscape has formed over years of Sami People tradition of reindeer herding.